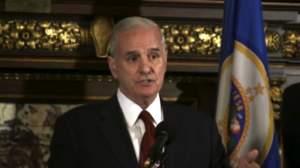 Governor Mark Dayton says he expects “progress” now that he has a DFL majority in the Minnesota House and Senate. However, he says even with those majorities, governing will be “difficult”. He made the comments after a meeting with House Minority Leader Paul Thissen and Senate Minority Leader Tom Bakk. Both are likely to be the leaders of the new majorities in 2013. Asked if that means the DFL majorities will increase taxes on the wealthy as Governor Dayton has often requested, Thissen says that needs to be looked at in the context of all tax policy.